Journal of Fluid Mechanics is the leading international journal in the field and is essential reading for all those concerned with developments in fluid mechanics. 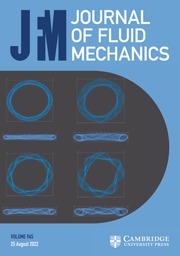 It publishes authoritative articles covering theoretical, computational and experimental investigations of all aspects of the mechanics of fluids. Each issue contains papers both on the fundamental aspects of fluid mechanics and on their applications to other fields such as aeronautics, astrophysics, biology, chemical and mechanical engineering, hydraulics, materials, meteorology, oceanography, geology, acoustics and combustion. Get a look at the latest in fluid mechanics research by watching the Journal of Fluid Mechanics playlist. A video abstract for the paper 'Thermal delay of drop coalescence'.